“This is Spanish?” asked one of my dinner guests, as I served a platter of rolled and stuffed pork loin. Well, yeah—pork, figs, Sherry, that’s all pretty Spanish. “It’s a recipe from one of my cookbooks,” I said. The guest, friend and colleague, Gerry Dawes, is a journalist and specialist in the wines of Spain who lives in New York, but spends long stretches of time travelling in Spain. 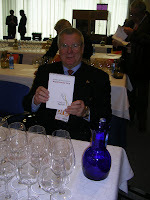 (Read about Gerry's talks with Spain’s top chefs, wine makers and other figures in the world of gastronomy.) Gerry was passing through town, thus the occasion for my dinner party. “You know,” said Gerry, “you could serve this dinner in an American home and, if you didn’t say so beforehand, I doubt if anyone would identify it as Spanish.” He went on to say that I should do a cookbook, based on Spanish ingredients, but oriented towards American tastes. Gerry calls it “modernized traditional” Spanish cuisine. In fact, once you take away paella, gazpacho and roast suckling pig, much of Spanish cooking could be modern-traditional-Mediterranean-Californian. Just add olive oil. I want Americans to realize that Spanish cooking is perfectly adaptable to how they want to eat. My menu was both Spanish and seasonal—chilly, rainy weather called for robust food and the days of carnaval, the Spanish equivalent of Mardi Gras, the last feast before Lent, seemed to demand an appearance by Don Carnal, Mr. Flesh. So, I went whole-hog and opted for a stuffed pork loin. Easy to prepare in advance, the loin could be popped in the oven before guests arrived. Requiring little attention, it was perfect for a dinner party. If possible, have the butcher butterfly the pork loin. To do this yourself: make a first horizontal cut, about one-third of the thickness of the meat, from one long side almost to the other side. Open up the flap. From the inside crease, make a second horizontal cut back to the first side, without cutting through the meat. Open up the second flap. You should have a single rectangular slab of meat, of more or less equal thickness. You will need skewers and kitchen twine to roll and fasten the stuffed meat. The meat can be salted, stuffed and rolled up to two days before cooking. Cover and refrigerate. Bring it to room temperature before continuing. Open up the slab of meat and sprinkle liberally with salt and pepper. In a bowl combine the bread crumbs, ham, pork fat and parsley. Soak the chopped figs in brandy for 10 minutes. Add the figs to the ham mixture with the garlic, rosemary, ¼ teaspoon salt and freshly ground black pepper. Mix well. Spread the stuffing mixture on the meat. Starting with a long side, roll the meat up. Secure with skewers, then tie it at intervals with butcher’s string. Heat the oil in a pan large enough to hold the piece of meat. Brown the meat on all sides, adding the onion and carrot when meat is nearly browned. Add the five remaining figs. Add the Sherry and water. Bring to a boil and cover the pan. Place in the oven. After 30 minutes, turn the meat. Continue roasting until the meat is tender and reaches an internal temperature of 145ºF, about 30 minutes longer. Remove meat to a cutting board and cover loosely with foil. Skim fat from remaining liquid in the pan. Purée the liquid with carrots, onion and figs in a blender. Remove skewers and string from meat and slice it crosswise. Drizzle some of the sauce over the meat and serve the remaining sauce separately. This side dish comes from Extremadura, where pimentón de la Vera, smoked paprika, is produced. It can be prepared in advance and reheated in the oven. Peel the potatoes, cut into chunks and cook them in boiling salted water with the bay leaf until fork tender. Drain, saving 1 cup of the cooking liquid. Mash the potatoes with a potato masher or wooden spoon, adding ½ cup of the reserved liquid. Heat the oil in a large skillet and fry the cloves of garlic until they are golden and remove them to a blender container. Add the pimentón, cumin and salt and remaining ½ cup of liquid and blend until smooth. Add the mashed potatoes to the oil in the skillet. Pour over the garlic mixture and mash it into the potatoes. Reheat, turning the potatoes in the oil. If they are to be prepared in advance, heap them in an oven dish, cover with foil and refrigerate. Bring to room temperature before reheating, covered, in a medium-hot oven. Heat the oil in a deep skillet and fry the pine nuts for a few seconds until they are toasted. Skim them out and reserve. Add the bacon to the pan and fry until crisped. Skim it out. Add the garlic to the pan and, when it begins to turn golden, add the chopped chard. Sauté the chard for 5 minutes. Add ½ cup water, salt and pepper. Cook, covered, for 10 minutes. Remove cover and cook another 5 minutes until most excess liquid has evaporated. Toss the pine nuts and bacon with the chard. Grate lemon zest over the top and serve the chard hot. My good friend, artist Charlotte Gordon (see her work here), was a recent dinner guest at my house. She loved the dessert, a Spanish take on cheesecake, and asked me for the recipe. So, here it is, for all to enjoy. Called quesada or tarta cuajada, this cheese tart comes from the northern region of Cantabria, famous for its cow’s milk cheeses. It is made with soft, fresh cheese, before the curds have been pressed or salted. You could use unsalted cottage cheese, beaten smooth; ricotta; fromage blanc; or yogurt that has been drained in a colander lined with cheesecloth for an hour. I substituted Greek yogurt—already drained and thickened—and cream cheese. I made a crumb crust by pulverizing leftover Spanish Christmas cookies, mantecados and polvorones, with their scents of cinnamon, almond and sesame, and mixing the crumbs with an egg yolk. You can use any favorite crumb crust or try the olive oil crust in my recipe below. The sliced pears are lovely for winter desserts. But the cheesecake is equally good without them. A tart fruit sauce—of apricots or raspberries—also goes nicely with the cheese tart. Incidentally, for those minimalist cooks out there, I make this “cheesecake”, without the crust and without the pears, in individual glass cups and cooked in the microwave (with a vented microwave cover; at medium power, for 2 minutes X 3, turning cups a quarter-turn after each 2-minute interval, and allowing to rest 5 minutes before removing). Olive oil makes a crisp-bottomed pastry that contrasts beautifully with the smooth cheese-custard and pear filling. For the crust: Combine the 1 ½ cups flour, baking soda, salt and ½ teaspoon cinnamon in a mixing bowl. Add the aniseeds and ½ cup sugar. Beat one egg and beat in the oil. Mix this into the dry ingredients. Use fingers to press the crust mixture into the bottom and 2 inches up the sides of a 9-inch springform pan. For the filling: Combine the sliced pears with 1 tablespoon lemon juice and ¼ cup sugar. Reserve 4 slices of pear. Spead the remaining pears in one layer on top of the crust. Beat the cream cheese at medium speed until smooth. Beat in the yogurt and the remaining 1 cup of sugar. Add ½ tablespoon of lemon juice and ½ teaspoon cinnamon. Beat in remaining 1 tablespoon of flour and 3 eggs, one by one. Carefully pour custard mixture over the pears in pan. Place reserved sliced pear on top. Bake until custard is set, about 75 minutes. Allow to partially cool before removing springform sides. Serve the tart warm or chilled. New Englanders may protest that their beloved chowder has “protected geographical denomination” and can’t possibly have a Mediterranean inflection. But, according to the dictionary, chowder is “a thick soup or stew, typically made of clams or fish and various vegetables”. By that definition, this Spanish fish soup certainly qualifies. Besides, its creamy, white color and the inclusion of potatoes and ham make me think of chowder. So, although chowder doesn’t really translate to Spanish, that’s what I named it in English. In southern Spain, where this soup comes from, it’s called gazpachuelo, sopa Viña AB (the name of a brand of Sherry), sopa sevillana or sopa malagueña. 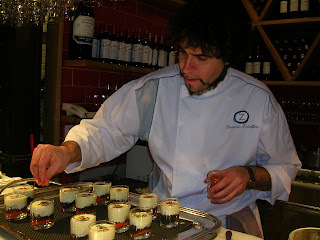 Its lovely, creamy consistency comes, not from milk or cream, but from an emulsion of olive oil and egg. Which is why I am making this Mediterranean chowder for dinner tonight. A few days ago, writing about my new olive oil (you can read about that here ), I prepared a batch of alioli, garlic mayonnaise—an emulsion of olive oil and egg. I served it as a party dip to guests, but I still have some left over—the starting point for the soup. I only needed to buy fish and shrimp. 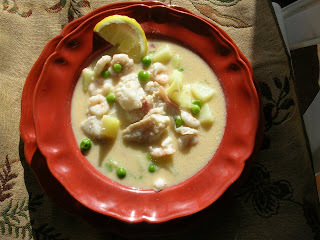 I like to make this soup as a main course dish, loaded with chunks of fish. I usually use fresh hake (merluza), a white fish related to cod. I use the head, bones and trimmings to make a simple stock. The chunks of boneless fish cook quickly and are added to the soup at the very last minute. Any white fish could be substituted for hake. I used halibut when cooking in Seattle. Small clams are often included too. If you use them, steam them open first, discard shells and add the clams to the soup at the last minute. Don’t boil the soup after you whisk in the egg-oil mixture or it will separate. Place the egg in a blender container. With the motor running, add the oil in a slow stream until it is thick and emulsified. Blend in the lemon juice and salt. Set aside. Put the fish stock in a soup pot and bring to a boil. Add the potatoes and simmer, covered, until tender, about 15 minutes. Add the peas and cook 5 minutes more. Then add the chunks of fish, ham, shrimp and Sherry. Bring the soup to a boil, then reduce to a simmer. With the motor running, ladle some of the hot soup into the emulsion in the blender. Remove the soup from the heat and whisk the emulsion into the soup. Serve immediately. The soup can be reheated, but do not boil. Makes 10 cups stock. Remaining stock can be frozen. Place all the ingredients in a large pot. Bring to a boil and skim. Partially cover and simmer for 1 hour. Strain the stock and discard solids. IN PURSUIT OF A BULL MARKET, grab it by the tail. What’s your biggest food expenditure? Probably meat. Meat prices are high and rising. You can save money by eating less meat. Try Chinese-style stir-fried dishes and Spanish stews in which meat is only a small part of a many-starred cast of ingredients. Choose less pricey cuts and know how to exploit big flavors. For example, rabo de toro, bull’s tail (also known as oxtail), will keep you solvent and well-fed. I bought it anyway and enjoyed it immensely. Rabo de toro is a classic of Spanish cooking. Slow-braised meat on the bones in a deeply satisfying red-wine sauce. Perfect for cold-weather dining. But not easy on the budget! The recipe is below. But, first, here are my other (recycled) tips—some of which, unlike the oxtail—are still valid. TIME IS MONEY. If you’re earning thousands of euros a week, this article isn’t for you. If you’re not, you can save piles of dinero by spending more time in the kitchen. Eschew convenience foods, pre-cooked and pre-packaged. You pay for it—in marketing studies, advertising, processing, packaging, transport, shelf display. Make it from “scratch” and you’ll save money. At the same time, you gain on the gastronomy side of the ledger, for home-prepared foods, from soups to sweets, show a flavor profit. SPECULATE IN PORK BELLY FUTURES. You’ll save on meat purchases. 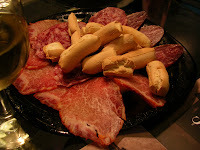 Pork in Spain is the most economical of meats. Spare ribs, bacon, sausage, scraps of ham add high venture flavor for little cost. If you’re splurging, go for solomillo, pork tenderloin, a bargain compared to beef tenderloin. MILK ‘EM FOR ALL THEY’RE WORTH. Dairy foods—milk, cheese, eggs and the rest—pack a lot of protein for low cost. Use as a meat substitute for main course dishes. Substitute olive oil for butter, quark for cream, to compound your gains. FROZEN ASSETS. Buy low, cook high. If lamb’s on special offer this week, buy lots and freeze. Purchase a big fish, cut into portions and freeze them. Buy strawberries at the height of the season, freeze with a little sugar for high-yield mousse all year round. Use cheap tomatoes (in season) for sauce and freeze. When freezing foods, take care in packaging to keep out air. Wrap meat or fish first in plastic wrap, then in freezer bags. Use uncooked frozen foods within two months for premium flavor. DIVERSIFY YOUR ASSETS. In other words, don’t put all your eggs in one basket. Get rich with lentils and beans, complex carbohydrates such as rice, potatoes and pasta. Gastronomically speaking, you’ll also win high rates for carbs served with pizazz—herbs, spices, volatile seasonings. HIGH RISK VENTURE. Dare to be different. Serve your guests Sherry or Montilla-Moriles instead of whisky; chicken livers instead of steak. GO FOR GILTS. As in stocks. As in soups. Great budget stretchers, soups. If you serve an especially good soup as starter, you can scrimp on what comes next because your guests already feel well-fed. A seasonal pumpkin soup might fill the bill here. Then, too, hefty soups with legumes and sausage or meat make the whole meal—just add salad and crusty bread. MARKET ECONOMY. It’s about supply and demand. Buy what’s in season and you’ll save money. Citrus is peaking and is local, but those melons in the market are imported from Chile on the other side of the equator (trailing a large carbon footprint). Cabbages are a bargain, but artichokes are early and pricey. KEEP INVESTMENTS LIQUID. So, what about wine?. Now’s the time to go out on a limb and investigate some of those lesser-known regions and wineries. This isn’t even risk investment! Spain offers some knock-out wines you’ve never heard of, for prices far less than the usual. Look for value for money in wines from Valdepeñas, La Mancha, Manchuela, Jumilla, Rueda. TIGHTEN YOUR BELT. Go on a diet and save money on food. Wash the pieces of oxtail very well, then blanch them in boiling water for 5 minutes and drain. In a large pot or flameproof casserole, heat the oil and add the onion, leek, carrots, garlic and bacon. Sauté until the onion is soft. Add the pieces of oxtail and brown them on a medium-high heat. Add the brandy, set it alight, and stir until the flames die down. Then add ½ cup of water, the wine, tomato, herbs, salt, pepper, red pepper flakes and cloves. Cover and simmer until the meat is very tender, about two hours. Add additional liquid as needed. The sauce should be fairly reduced. This can be made in advance, refrigerated, skimmed of fat and reheated before serving. The Spanish word for oil—aceite—derives from the Arabic phrase that means “juice of the olive.” (Interestingly, the Spanish word for the olive tree—olivo—comes from the Romans who preceded the Arabs in Spain.) I’ve just come home from the olive mill with a five-litre jug of olive juice—extra virgin olive oil—payment in kind for the olives I picked. It’s been an unusually rainy winter (¡gracias a Diós! ), which meant I didn’t spend so much time outside picking. A lot of this year’s crop dropped and was lost. Working alone, I only collected two big gunny-sacks. I carted them off to a mill in a nearby town and saw them dumped into a bin on the scales. All those hours of picking resulted in just 59.5 kilos (131 pounds). But I was delighted to carry home my jug of olive oil. I decant the oil into glass bottles and store them in a cool, dark cupboard. Light, which causes oxidation, is the worst enemy of oil. I keep a small bottle near the stove, always at hand for cooking, and refill it frequently. The new oil is somewhat cloudy, though it will probably settle and clarify with time. I set out a saucer of oil and chunks of bread for dipping. The oil has a pungent fruity aroma. It tastes fresh with a hint of bitterness and almost none of that raspy sensation in the back of the throat. The oil is a “coupage” of pressing from several varieties of olives from many different olive groves in the area. Now salad—lettuce, baby spinach and scallions from the garden (yes, in February) and green beans from the freezer—dressed with a little Dijon mustard, olive oil, a very little wine vinegar, salt and pepper. Perfect. In my kitchen, olive oil is the only fat. No butter, no other vegetable oils. I use olive oil for Chinese stir-fry. I drizzle it on pop corn. Mashed potatoes get their flavor from olive oil. I “butter” toast with it. I even use it in pie crust and carrot cake. Olive oil, as we all know, is more healthful than most other fats. It’s also the most important ingredient in Spanish cooking. How olive oil tastes depends on the variety of olive, the soil, climate, ripeness of the olives, but, most importantly, how the olives are picked, transported, stored and milled. If you ever wondered just how a virgin can be “extra,” it has to do with how much “manhandling” the olives had. Careful picking, transporting, storage and milling produce the finest extra virgin oil. Spain produces more olive oil than any other country in the world—between 35 and 47 percent, depending on annual fluctuations. There are 309 million olive trees extending over 5 million acres of Spain’s landscape (only 18 of them are on my property). The province of Jaén alone produces more olive oil than all of Greece. A lot of Spanish olive oil is exported to Italy, where it is bottled for marketing in the U.S.
You’ll find more about olive oil—including recipes—at this web site: http://www.oliveoilfromspain.com. And, for sure, more from me on this blog. Here's a recipe for alioli--garlic mayonnaise made with olive oil. It makes a great party dip--three versions, with quince, with piquillo peppers and plain. This version of traditional alioli is made in a blender, using a whole egg in place of egg yolk. (If raw egg could be a health risk, substitute pasteurized egg.) Use it as a sandwich spread or salad dressing; serve alongside grilled fish, rabbit or lamb chops; as a dip with vegetables or chips; dolloped into soups, or as an accompaniment to Spanish rice dishes. Use your best extra virgin olive oil, because flavor is what it’s all about. Variations: Saffron mayonnaise: crush a pinch of saffron threads. Add 2 tablespoons of hot water and allow to steep 10 minutes. Stir the saffron water into the mayonnaise. Honey mayonnaise: Dissolve 1 tablespoon honey in 2 tablespoons hot water. Stir into the mayonnaise. Quince mayonnaise: stir 1 ½ oz quince paste with 2 tablespoons boiling water until softened. Blend into mayonnaise. Red pepper mayonnaise: purée tinned red pimiento and stir it into the mayonnaise. Caper mayonnaise: add 3 tablespoons drained capers to the mayonnaise. MADRID FUSIÓN: A gastronomical summit meeting, a three-day coming together of chefs, food producers, consumers and press to show, show-off, explain, taste, promote, provoke and schmooze. It’s billed as the world’s largest food fest. This is all about alta cocina—haute cuisine in its avant-garde manifestation. It’s a get-together of celebrity chefs—mostly Spanish, but with a few from around the world. Get ready, New York city! Dani García is coming to town. García, an up and coming young chef who has two Michelin stars (the first was for Tragabuches, in Ronda; the second, for Calima, in Marbella;), will open La Moraga, a “gastrobar,” in Manhattan before the end of the year. It’s part of a franchise operation, in collaboration with the Andalusian regional government, to export tapas to the world,” said García. Hare-brained, by Ferran Adria. Hare’s brains are on the autumn menu at El Bulli. Adrià here presented a short, ravishing video illustrating his techno-emotional approach: A wild hare bounds across a field. Shots ring out. The carcass is skinned. The bloody skull is split open and the brains removed. The miniscule loin is seared, plated with gellified spheres of red fruit— Drama, music and visuals are heart-stopping, if not appetite-whetting. Next generation. 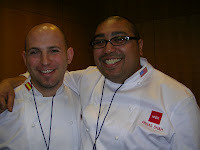 I chatted with Jeffrey Weiss of the Bay area (Calif) and Paras Shah of New York city, two young chefs who are part of a group of twelve from all over the world (Denmark, Germany, Switzerland, Brazil, Mexico, India, China) spending a year in Spain getting familiar with Spanish products and working in the kitchens of top restaurants. The program is sponsored by ICEX (government commercial and export division). 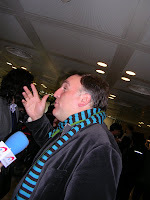 Alan Ducasse. Too lazy to go fetch the translator earphones, I couldn’t follow what Ducasse had to say. Even the moderators, those two gastro-gnomes, José Carlos Capel and Rafael Ansón, spoke in French. Grant Achatz (of Alinea in Chicago). I could kick myself! 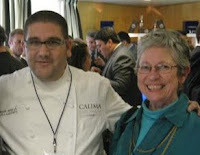 Too busy eating ibérico ham, I missed Achatz’s “dialogue” with Dana Cowin, editor of Food&Wine mag. José Andrés (restaurants in Washington D.C. and L.A.), inspired by the glass-art of sculptor, Dale Chihuly of Seattle, demoed a salad of vegetables and a spun-sugar caramel. José, a great communicator as well as innovator, said technology is the way to avoid chaos in the kitchen. Marco Sabatini, purveyor of truffles, dropped a black truffle weighing 440 grams and it shattered into crumbs. He swept up the bits and took them home to make risotto. On a happier note, truffles were auctioned for charity—a white one from Asti (Italy) brought €5000 and black ones from Soria (Spain) netted €3000. I liked the way everybody passed them hand-to-hand. You could sniff your hands for the rest of the day. Tapas. OK, OK, tapas aren’t new. Why they’re trendy all over again is that, with the economic downturn, less is more. Tapas now are a marketing tool and branding concept. Chefs like Dani García (see above), whose new La Moraga restaurants are designed to make alta cocina (haute cuisine) affordable. Mixology. Hours of seminars and tastings were devoted to cocktails (“the history of the gin-tonic”). I attended not a single one nor sipped the herbal martini, aged rum, tequila or gin. I did take a turn through the Bar Show and had a Schweppes tonic, with Asian grapefruit slice and a few juniper berries. Nice. Market cuisine. The market is Mercado de San Miguel, adjacent to Madrid’s Plaza Mayor. The original market, with its structure of forged iron struts, dates from 1916. It has been refurbished and now has real-time vendors of fish, meat, bread, fresh produce and eating stalls. 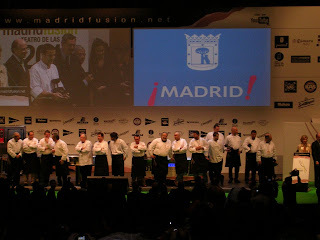 During Madrid Fusión it opened for a night-time event, where some top Madrid chefs took over the market stalls. I loved the whimsy of one-star chef, Fernando P. Arellano of Restaurante Zaranda, whose cups of black tapioca with griddled cuttlefish were a visual knockout (red piquillo peppers beneath the tapioca), texturally thrilling (creamy scallion foam and kernels of fried red rice and Espelette pepper) and absolutely delicious. Serving plates that light up. Presented by Elena Arzak (daughter of famed Basque chef, Juan Mari Arzak) and created by Philips Design (division of the electronics firm), the plates subtly backlight foods with glowing color, switched on as foods are placed on the plate. “Color is one more flavor-sensation,” said Elena. She said the restaurant is very interested in pursuing research of this sort. Red cardoons. I’m always on the look-out for something new, and cardo rojo de Ágreda is this year’s find. A cultivated thistle (Cynara cardunculus), related to the artichoke, cardoons look rather like celery—a bunch of thick stalks topped with leaves. Like celery, the stalks need to be stripped of stringy bits. 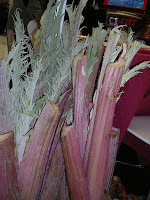 Cardoons are usually boiled until tender and served with a sauce of ground almonds (typical for Christmas Eve dinner). These red cardoons come from the municipality of Ágreda, on the border between Aragon and Castile, where the mature plants are buried under a mound of soil to protect them from early frosts. This gives them flavor, color and crispness, so they can be eaten raw. Here they were chopped and tossed with a vinaigrette. Crunchy and tastier than celery. Estate-bottled olive oil. 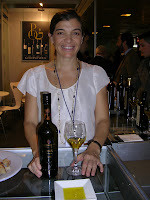 I met Xandra Falcó, commercial director for Pagos de Familia Marqués de Griñón (her father, the marques, makes superb wines). The family’s extra virgin olive oil, produced and bottled on the Capilla del Fraile estate in Toledo province, is intensely fruity and subtly bitter. Cured ibérico pork loin. By now you know that acorn-fed ibérico pigs produce the world’s best ham. But pigs are more than hams and shoulders. Boneless loins also are dry-cured with salt and a hint of pimentón (paprika). At the stand of Sierra Mayor de Jabugo, Julio Revilla Saavedra poured manzanilla Sherry and served a platter of his company’s exquisite lomo, loin, as well as sausages. Sopa Castellana. 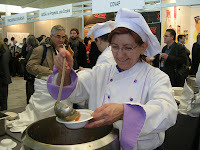 Castilian soup—also known as garlic soup (my recipe can be found here) was served at lunch to the multitudes of conference-goers, courtesy of the city of Valladolid. Thickened with peasant bread, redolent of garlic and pimentón, it was the perfect sop for all the great wines being poured. And a nice counterpoint to the overly-elaborated chef’s food. Cheese. I kept grabbing samples of torta del Casar, an extraordinary sheep’s milk cheese from Extremadura. 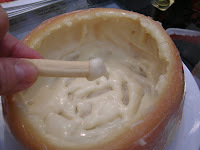 The cheese has a subtle, appetizing bitterness, due to a vegetable thistle coagulant, and a natural, creamy dipping consistency. Nespresso. The coffee hit the spot—but I missed George Clooney. To Esmeralda Capel, one of the organizers of Madrid Fusion, who opened doors for me; to Jone Urrutia, press gal; to Gerry Dawes, who knows absolutely everyone in Spain’s world of gastronomy, and to Ed Owen for his hospitality.